England have just returned from the Caribbean. It was an unusual tour and, before departing, those who I discussed the upcoming series with were concerned as I was about the injuries to the three front line seamers that would prevent them making this trip. 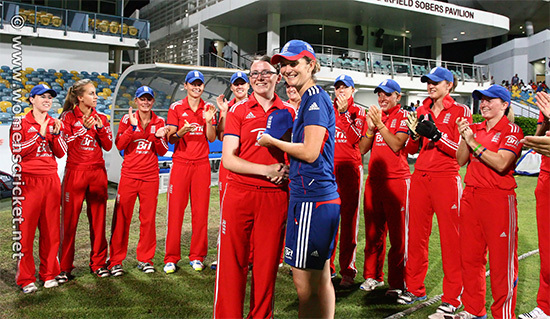 Brunt, Shrubsole and Elwiss were all rested and how would the second string get on we wondered. Inevitably some would be making their first appearance. I was only able to travel for two weeks and so our small party picked the second week in Barbados and the only week in Trinidad. The trip was not to disappoint. The stadium in Barbados is one you might see anywhere around the world although one feature is not one you'll see at Lord's anytime soon. That was the interesting selection of high quality cheap food on offer. Whether to eat before you arrived or after the match was not a question that needed raising - food at the venue was fine. And the cricket? Well a large (3,000?) and an interested crowd enthusiastically supported their own side in the T20s played there. England also found supporters, not just in the group of parents, but a new 'Barmy Army' of (presumably) a group of youngsters on holiday made sure they not only shouted for the players, but featured on the local TV. 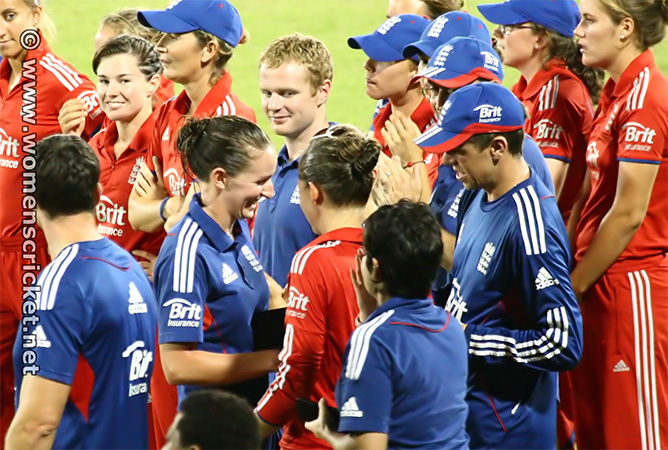 The first match against New Zealand proved relatively straightforward for the English and doubts about one of the youngsters were dispelled when Tash Farrant showed she was far from out of place on the big occasion. While Nat Sciver (4 wkts) and Jenny Gunn (5) took the wickets, Tash (1) bowled well with some swing and finished with a more than acceptable economy rate. 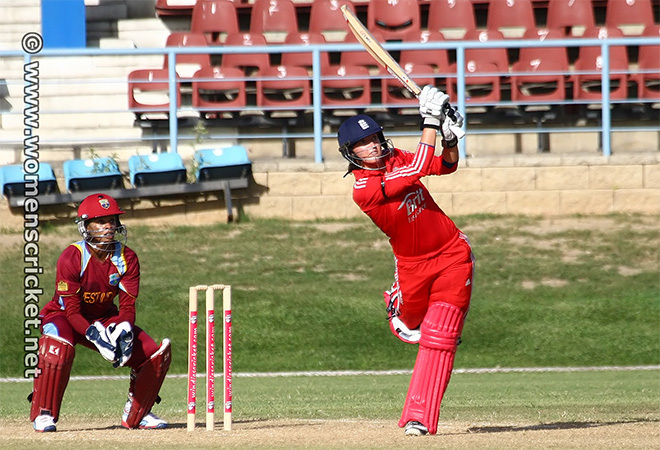 Danni Wyatt provided the backbone to the batting with 37. The next match, against the West Indies, proved to be a real nail-biter, finishing as a tie. Oops (or one over per side) more commonly known as a super-over came into play. Now you have to admit that if any side is well equipped to bat in such circumstances then it's the West Indies, and they were as good as their reputation. England, however, were safely into the final before the match started so the 'big' match was to follow in a couple of days. Two players made their debut in this form of the game, Kate Cross and Beth Langstone. In the final England won the toss and decided to bat, influenced no doubt by the fact it was a day/night match. 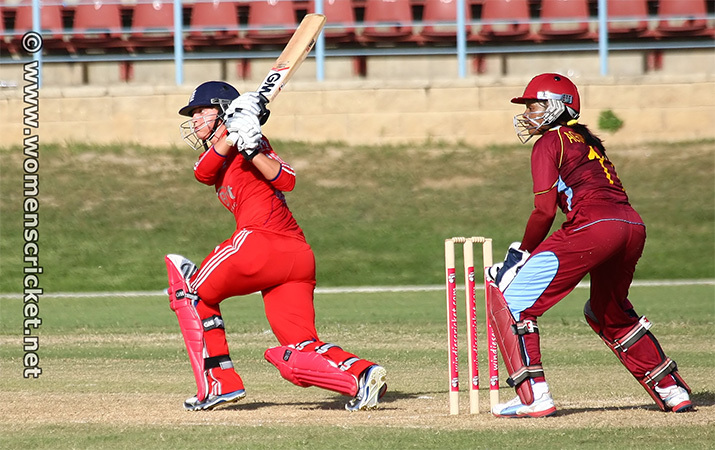 Sarah Taylor and Nat Sciver provided the backbone of the innings and while those around me speculated that it wasn't enough I am not sure that we suspected that Taylor and Dottin would accomplish the England total almost single handed. 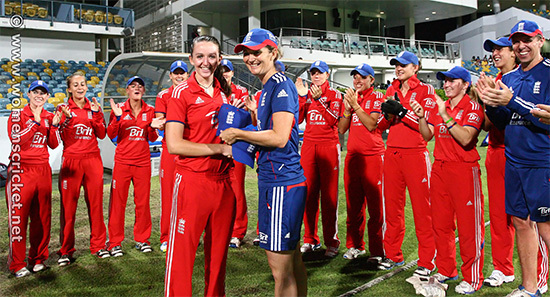 It was a fine knock from both of them and 17 overs sufficed to match England's score. New Zealand were now on the plane home with the prospect of hosting the West Indies in the near future, while the other two teams moved to Trinidad for a three match series of ODIs. Here, said the England spectators, we were better suited, and so it was to prove, although many returned to the UK with just six parents and friends taking the next step in the journey. The Queen's Park Port of Spain ground is very different from Bridgetown, Barbados. It looked a sorry sight in the rain as we hoped for a start but the friendliness of the locals more than made up for the damp and slightly run down look of the area. We were invited to the Long Room, taken around the splendid museum housed on the ground floor and treated to some of the best food, both in the Long Room and from the concessions in the stands, that we had experienced all holiday, and we had no complaints about Bridgetown in that regard! And indeed we managed to inspire them with our feelings on the sport - the museum had no women's cricket exhibits when we arrived but team pictures, signed shirts etc. were left in their charge. Special among the exhibits, and of especial interest to me as a photographer were some large pictures of Lord's taken at the end of the 1800s. These were found in a skip in the grounds and rescued, copied and then the damaged patches restored. It was intriguing to see the originals mounted alongside a restored copy. The Photoshop user had done a fine job! I was also intrigued to see Gary Sobers' bats with which he had made his Test centuries and those of Brian Lara. Immediately obvious was the fact that Sobers' had no chips from the edge of any of them - not so for Lara's. Could this be right I wondered? The match, however, was abandoned after just a few overs. The weather proved better for the second match in the series. West Indies won the toss and decided to bat. 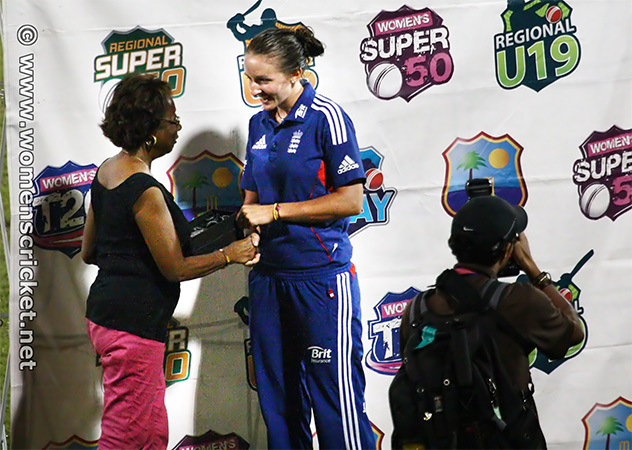 Here one of England's relative new-comers came into her own and by the end of the evening Kate Cross was picking up the Player of the Match Award for her 4 wickets. 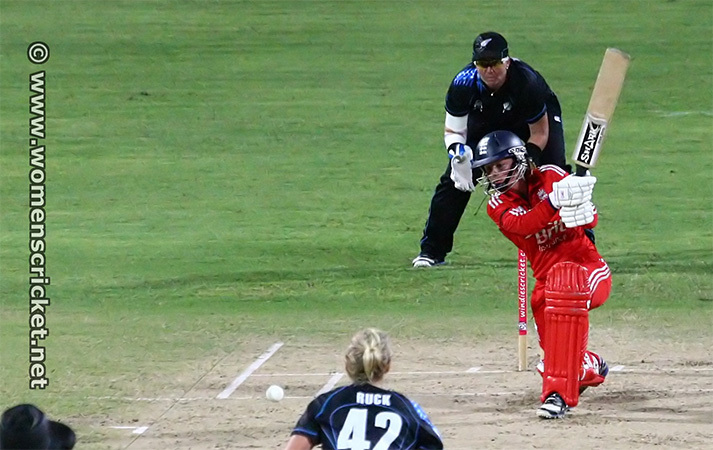 During the course of the final game, Charlotte Edwards took a superb catch. It proved an interesting exercise to try and record it as I am often teased about failing in similar circumstances! In this case I was fortunate to be in a suitable position. This is not always the case!!! In the sequence below, the ball has passed over Charlotte's head and she is running full tilt away from the batsman (Deandra Dottin - still on '0'). To ensure focus it is necessary to keep a small illuminated red square in the centre of the viewfinder on the player throughout. As she turned away from me I lost focus (the background looks great...). The last frame was taken following Charlotte hurling the ball into the air in triumph. That final match of the fortnight also gave rise to one of the finest innings I have witnessed in this form of the game for some years. England lost early wickets with three of the top four batsman managing only 28 between them, but check the score of Sarah Taylor batting at number three. Her century off 108 balls was possibly the finest innings she has played to date. Sensibly setting out to bat through she managed that to perfection speeding up as the innings neared the end and being unfortunately dismissed off the last ball. Some 'red ink' on the score sheet had been well deserved but unfullfilled. The thought of returning to a colder climate did not appeal and my first trip to the Caribbean had been well worth the taking. I must thank my travelling companions who made the non-cricket hours most enjoyable. It is commonplace to find examples of how women are ignored in discussing any sport, but I found an example only recently which brought back a memory of the 2009 World Cup. English readers will be familiar with a periodical known as "Radio Times" which lists the TV and radio schedules for the UK. A few articles are also included and one recently was entitled "Know Your Enemy" and contained an interview with Jason Gillespie. In this article he claimed to be the first person of aboriginal descent to play cricket for Australia. As so often with these kind of claims, it simply isn't true! Faith Coulthard played a Test for Australia in 1958, her one representative match, some 17 years before Jason was born. I was introduced to her in a shopping mall in Sydney and fortunately had my World Cup cap with me which she kindly signed. She played State cricket for South Australia.